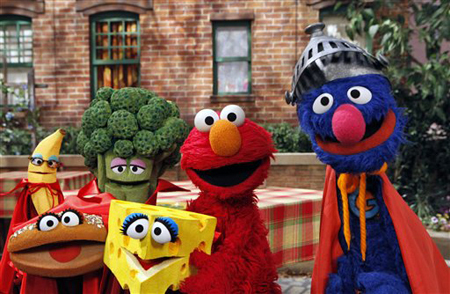 The White House and the Let’s Move campaign made a SUPER awesome announcement today: The Sesame Workshop is teaming up with the Produce Marketing Association and the Partnership for a Healthier America to use the Sesame Street characters to encourage kids to eat more fruits and vegetables! This couldn’t be more exciting or important for the health of our children! According to the Robert Wood Johnson Foundation, between July 2009 and June 2010 McDonald’s and Burger King placed over 25,000 ads aimed specifically at children. Yup, that’s 25 THOUSAND! Over 20,000 of those were on just FOUR channels: Cartoon Network, Nickelodeon, Disney XD, and NickToons. Kids pay attention to these ads! A study published in the October 2012 issue of the Archives of Adolescent Medicine looked at how branding affected food choices in 8 to 11 year olds. The researchers offered kids a choice of a cookie, an apple, or both. Initially, the vast majority of children chose the cookie, however when researchers placed a sticker of Elmo on the apples, the number of children who chose the apple nearly doubled! Try using this strategy at home. Find stickers of your child’s favorite characters and place them on apples, oranges, pears. Arrange fresh vegetables in the shapes of characters of objects your child loves. This adorable Minion lunch is courtesy of Creative Bentos by Glory over at Glory’s Mischief. It’s a fantastic resource for creative and FUN ideas to get your kids to eat healthier and get closer to achieving the 5 in the 5210+10! What’s worked for getting your family to eat more fruits and vegetables? Share your tips and ideas in the comments secction. In the meantime check out Elmo and Rosita’s appearance at the White House. They share some great information about fruits and vegetables and tell us their favorite ways to enjoy them.